Since I’m going to be teaching a class on Forward Motion called “Basic Training on Military Culture” starting November 5 (tomorrow! ), I thought it would be appropriate to have a military theme for this month. So drag off the combat boots and join us for a spell to learn about the military. If a soldier comes into the military single/unmarried, the army puts them into the barracks. They don’t have a choice about it and will stay into the barracks until they get married. While I’ve never lived in a college dorm, I believe the best description of barracks life is probably close to dorm life. You have a bunch of teenagers living together, though also with a mix of older soldiers. All enlisted — the officers were never in the barracks. What did the rooms look like? The rooms came in two sizes. One was like a large bedroom, and that was for two soldiers. A larger room was for three soldiers. We each got a wall locker, a small 3-drawer chest (the size of a nightstand), and a twin bed — really a bunk bed. The bed had two drawers underneath for additional storage. We also had a refrigerator and a desk. Yeah, it wasn’t much space. Particularly from the old-timer soldiers, there was an attitude that the single soldiers didn’t need much of anything. I particularly saw this during the numerous moves we had to do. Everyone kept thinking that all we had was a duffel bag, so we were often told to move in one day and expected to be military perfect instantly. I had books. I had a computer. It was never simple. I often had to throw everything in a box to make the move happen and could never unpack. The worst move was when we were told to move across post in the middle of a hurricane! Extra furniture beyond what the army provided also drove the old timers crazy. We had a soldier senior enough to have a room by herself, and she had a sofa in it. One of the sergeants wanted her to get rid of it — believe it or not — because other soldiers couldn’t have a sofa. Her response was that it wasn’t her fault if they couldn’t afford one. What were the facilities like? We had one washing machine and one dryer. If you didn’t stick around in the room and guard your laundry, someone would come in, take your clothes out of the dryer, and put theirs in. For bathrooms, I was in two different barracks. The first had shower stalls with tile, which seemed like a luxury compared to the World War II barracks we later stayed in. We were lucky we had toilet stalls. The showers were in bays of three, with the kind of tile that’s never going to look clean no matter how much you bleach it. I didn’t take a bath for six years, except for occasional visits to hotels when I was on leave. Below is a photo of the type of World War II building I stayed in from TPB, Esq. Inside the buildings were signs that warned, “Maximum weight per square foot is 100 pounds.” Think about that for a while. 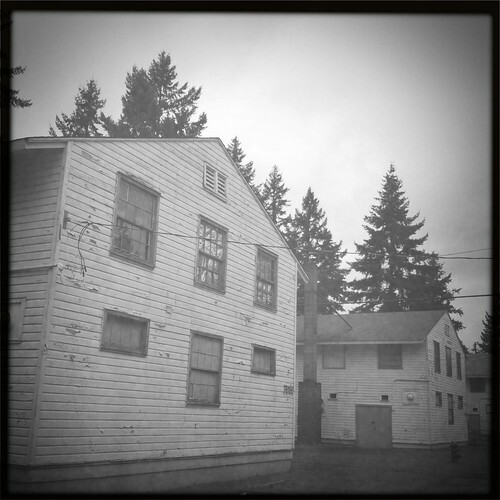 Screen reader: Photo shows an old World War 2-story building. The buildings were intended to be temporary and they look temporary. The walls are wood siding painted white. Three sixteen pane windows are on the top floor and one on the bottom floor, along with two four pane windows. The photographer identifies this building as condemned, so the paint is flaking off. What were the rules of living in the barracks? No hard liquor, but you could have a 6-pack of beer. I didn’t get this one because you can get drunk off both. You couldn’t have anything out on the desk. At all. So if you had a magazine that you were reading, you had to put it in a drawer. You couldn’t leave on the desk, no matter how neat it was. I couldn’t even save soda cans to recycle because that was leaving trash out! Door checks. At night, the staff duty officer would come through the female barracks and try the doors to see if they were locked. Imagine lying in bed asleep and being awakened by someone unknown turning your doorknob. Then, maybe I’ve been writing fiction, too long! The worst thing about barracks life was really the music. There were always several people who had to play their music at full volume, as if they were daring someone to complain about their music. Sometimes two would get into music dueling wars and turn the volume up to try drown each other out. Having never served in the military, I am finding your account of life there to be quite interesting. I hope you’ll continue to write more about it. I can’t believe that you were forced to move during a Hurricane? Why was this? Was it some sort of test for the soldiers? It was bad planning, Wendy. Our entire company had to move off main post to North Fort to make room for another company. There were separate buildings for the males and females, and the one for the females wasn’t ready yet. So we were told we weren’t moving right away; meanwhile, the males had about a week to clear out. Plus, we were also moving offices that were in the company building, including the one I was working in (packing up files and computers and such). So we didn’t have a date we were supposed to move, and we couldn’t pack up (that problem with being messy). On late Friday as the storm arrived, we got word that the females had to be out by that weekend. So I’m throwing things into boxes on the fly, tossing them in my roller skate of a car, and driving six miles to the new location, and dropping off the boxes, so I could go back and get more. I was the last one out of the barracks.